Incredible range of classic pinball machines from Williams, one the world's greatest manufacturers. Over 20 games to try for free in our showroom. Free delivery and installation. 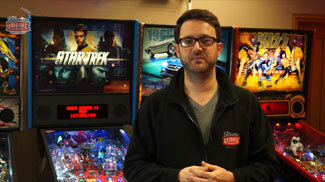 We take you through buying either and brand new or reconditioned/vintage pinball. We run you through the current manufacturers available today, the new games which are on the horizon at the time of filming, and what to look for if you opt for a secondhand pinball machine. Williams Pinball Machines are classic pinball machines from one of the true greats of pinball manufacturing: Williams Electronics, Inc.
Williams traces its roots back to the Williams Manufacturing Company, founded in 1943, but in 1974 Williams Electronics was born and went on to create many well-loved games of the 70s and 80s. These included many great arcade games such as Robotron: 2084 and Defender, as well as classic pinballs such as Pin*Bot and The Addams Family. Their pinballs are some of the best classic pins from the Golden Age and are much-prized by collectors. We are keen pinball players here at Home Leisure Direct and have a selection of pinball machines on display in our showrooms, including some of Williams' greats such as Medieval Madness and Demolition Man. We love all things pinball, and are often able to get hold of rare tables that other retailers can't get. If you're looking for a particular pinball, please give one of our friendly staff a call on 0800 622 6464 or 01454 413636 and we'll be happy to discuss your needs. Delivery & Installation is free to any location within 150 miles of our Bristol showroom, within mainland UK. However for locations further than 150 miles there may be an additional charge depending upon your exact location. Please call our friendly customer service team on 0800 622 6464 for a quote. Delivery and Installation will be made to the ground floor room of your choice, provided we can park our delivery van near to your property, have easy access and no steps or steep slopes to negotiate. You can call us free on 0800 622 6464 and speak to a member of our expert team who will be able to answer any questions you might have about our range of pinball machines for sale. For help and advice please contact our expert team on either 0800 622 6464 or 01454 413636 and we will be happy to help. If you prefer to pay us a visit please see our Showroom page for details and for directions check out How To Find Us.